The circus train signs sport WOO’s trademark color combo of red and yellow. Schindler’s List, Jaws, 1941, Joe vs. the Volcano, Twister, Inner Space, Jurassic Park, Used Cars, Sugarland Express. When Indy comes home with the cross he risked his life to save, his father pays just as scant attention to his dilemma as Aunty Em and Uncle Henry do to Dorothy and her tale of Toto and Ms. Gulch’s garden. 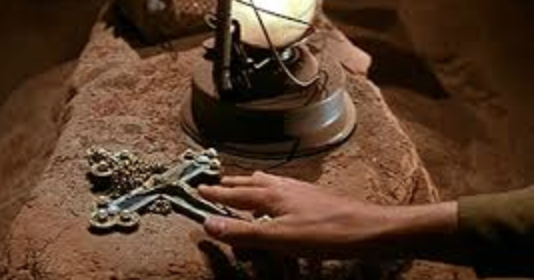 The cross he rescues is similar in size and shape to lion’s medal from Wizard, Indy’s own reward for his courage. And when the law arrives later in shape of paid off sheriff, the same injustice is perpetrated on Indy as was Dorothy and Toto, with just as little help coming from authority figures. Result: both Dorothy and Indy leave ‘home’.